Advice on how to program this? Need a bit of help with programming a specific chase I need - this make take a bit of explaining, but hopefully it'll make sense. So I've got four moving lights, and I want to create a chase that instantly puts the intensity to 100%, then fades back down to say 0% on each light one after another (position and other attributes are not needed). Sounds simple, however I need to co-ordinate when the lights snap to 100% with the BPM of a song. So on each beat, a fixture will be set to 100% then immediately after it will start to fade down to 0%, until in four beats time where it will be called back to 100%, and the cycle continues, etc.. I've tried making this as a chase within a playback, but the separate fade up / down times don't make a difference as you can only set the 'attribute fade percentages' which doesn't achieve what I want. 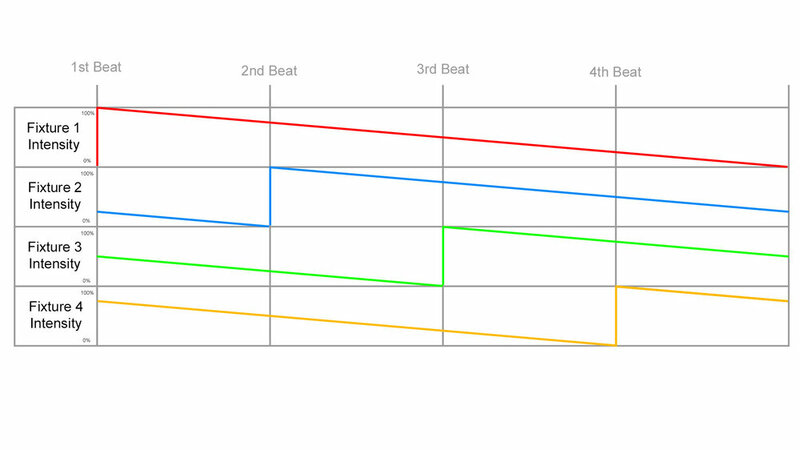 I have also tried to make a playback with follow / wait times by working out the amount of time between each beat. With our track (158 bpm) it happens to be 0.379 seconds. This method would work great, however you can only enter a wait time with 1 decimal place, meaning it quickly becomes out of sync with the track. In addition, it would be nice if we could do this type of thing with the effects generator but as far as I'm aware there is no way to match the speed of that with a set BPM. I have drawn a graph below which I hope will help to explain what I'm after - but might just end up making you all more confused, haha. *EDIT* Been playing around in Phantom ZerOS it seems like the RampInv function in the custom effects generator gives the effect I want, but how can I match this to the BPM? Or is this not possible? Thank you for your detailed query. Currently there isn't an easy way to do what you're after. I have however logged this on our software tracker as ZOS-8653 as a request. To implement this, we would look at allowing for a Chase Fade percentage of greater than 100%. You could therefore set "Ramp Down" and apply a fade percentage of 400%, which would fade the step of the chase out over the following 3. Intrigued - why isn't this a 4-step chase with tracking of the intensity on the non-snapped fixtures? Then using tap tempo to set the beat? Chases currently don't let fades from a cue fade into subsequent cues. Once a cue has finished fading out, the next will play. This is of course different to a normal Playback, where you can have Auto-With cues, that allow for the previous cue to fade simultaneously/underneath the current cue. Therefore allowing chase fade percentages to be greater than 100% would allow you to have this functionality. Chases currently don't let fades from a cue fade into subsequent cues. Once a cue has finished fading out, the next will play. This is of course different to a normal Playback, where you can have Auto-With cues, that allow for the previous cue to fade simultaneously/underneath the current cue. Aha, makes sense because of the Auto-With. Thanks Edward!